Since the world witnessed the rise of the nation-state, world geopolitics have not been as turbulent as those prevailing in the XXI century. As in that historical period, the world was shaken by wars, disease, and famine. Unlike those days, today modern technologies facilitate the global movement of these three scourges. But perhaps the most critical difference between the XVII and the XXI centuries is that back then, the world energy structure was diverse, while today is it is dependent on a single resource: oil. And the world is running out of this non-renewable source of energy. Indeed, the world is running out of cheap oil. Like the production of most mineral commodities, the production of oil follows a bell curve. The top of the bell coincides with the point at which 50% of the known reserves of oil have been depleted. The date for such an event to take place has been forecast to be between 2004 and 2010. We thus have roughly 15 years to rebuild Western civilization, as soon oil production will meet a negative EROEI (Energy Return on Energy Invested). This simply put is the point at which no matter how much oil is underground, its extraction cost would make it useless for economic purposes. In the 1950s you needed one barrel of oil to extract 30 barrels. By the 1990s the ratio had fallen to 5 to 1. Once the ratio hits 1 to1, oil may be technically extractable but it will be of no use as an energy source. The occurrence of the Oil Peak or Huber’s Peak would call for strong international cooperation to rapidly increase output while curbing demand and investing in alternative energy sources. But what if someone has an alternative plan? The Middle East finds a path to stability; the Americas actively engage in development of energy resources, as the region holds 12% of the world’s energy reserves. 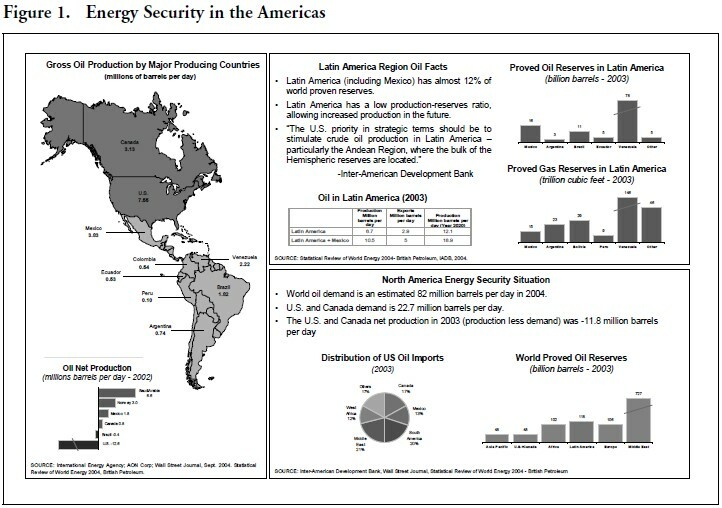 The Americas come together under a development-based approach to Energy Security which reduces the rate of consumption of oil in the United States while creating up- and down-stream job opportunities for the lower income echelons in the countries where significant oil and gas reservoirs are located. Pricing policies entice development of alternative sources. Over a period of 20 years, the energy structure of the Americas becomes the most diversified in the world. Innovation tied to alternative sources of energy boosts development rates in the hemisphere. Democracies become gradually more stable, as the development approach touches the daily lives of the many who now have a stake in stability and growth. Ethanol, compressed natural gas, hydroelectric power, nuclear and solar energy, reduce oil consumption and the speed of the oil depletion curve. The world economy finds some bumpy roads but rebounds strongly thereafter to enter a three-decade long growth path. Castro is about to face an embarrassing demise from world history. Economic collapse is nurturing a strong internal opposition that is about to launch a people’s movement against the regime. Energy deficits are critical. Venezuela is about to change its vote on the Human Rights Commission in Geneva, opening the path to international direct surveillance of Castro’s political practices. Castro decides to exact retribution by inviting to Cuba the leader of a failed coup d’etat who was pardoned by an unwise head of state and suddenly the spark of strategic vision lightens Castro’s rainy days. • enables that regime to successfully wage a power struggle with the United States. The strategy of course is nothing new to historians. The fall of the Soviet Union has cleared the path to documentary review the strategic raison d’etre of the alliance of that nation with Cuba. For the Soviets, Cuba was an excellent watching post and a good reminder to the United States of how close to its homeland the Soviet Union could get. As such, Cuba could be used to revitalize communism in Latin America so as to make the United States deploy diplomatic resources in the region to keep Cuba under control. Meanwhile the Soviet Union could continue to expand its influence zones in Asia an Africa. Needless to say that for Cuba the deal was, simply stated, a life insurance policy for the Castro regime. When Castro attempted to up the ante and engage in arming guerrillas throughout the hemisphere, the Soviet Union tightened the reins. The guerilla plan was best suited for Africa, where there was no modus vivendi with the United States. Enter the XXI century. No Soviet Union any more. The United States engaged in a war against terrorism; Castro under firm control of politics in Venezuela. Suddenly, as if by spontaneous generation, Chávezlike political movements begin to sprout in Latina America. Propelled by a decade of reform policies that fulfilled the financial targets of Wall Street while forgetting Main Street, Latin Americans are in search of saviors. Castro and Chávez have fanned this discontent by carefully selecting allies in countries where energy resources are key to the national security of the United States. Ecuador is about to introduce the policies of institutional deconstruction; Bolivia will soon see President Morales emerge victorious from elections to then convene a constitutional assembly; Peru is seeing the rise of an indigenous leader with a platform that resembles that of Morales in Bolivia. What do these countries have in common? Energy Stupid! As the Huber’s Peak clock ticks I wonder if any of you will be able to sleep tonight.